Today, language translations are predominantly associated with the business world. In an era of globalisation and technology developments, companies and organisations are able to trade practically without any boarders, and so language often remains one of the main and most challenging obstacles. Nonetheless, translation in one form or another has been with us throughout centuries. In many cases directly affecting the outcome and playing a key part in shaping historical events. 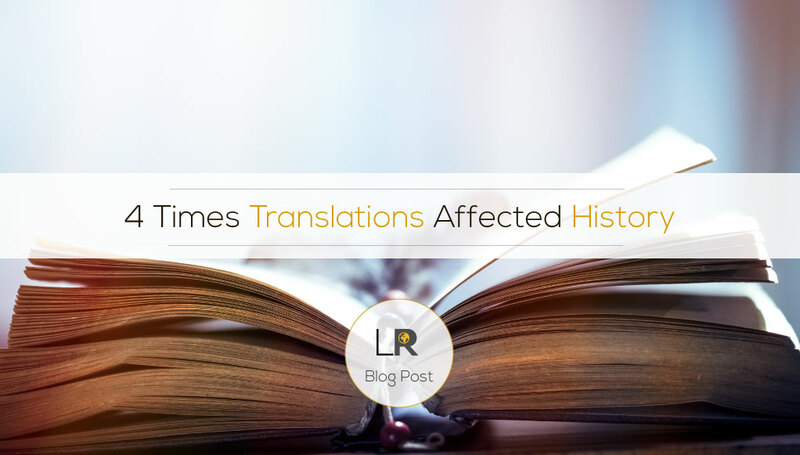 Here are some examples of translations, which affected the course of history. Bible is, without a doubt, one of the most significant texts in human history. The historical events inspired by these texts are quite simply immeasurable. From wars and crusades to charity, aid and acts of courage – the Bible inspired countless actions. As Christianity spread across the world, the texts had to be translated from the original Hebrew and Greek into Latin and then further into other languages. One of the most significant translations of the Bible dates back to 382 AD. when Pope Damasus I asked St. Jerome to translate the Old and New Testaments into Latin. Translation and interpretation of the original Biblical texts truly shaped the world we know today. In many, many ways, the Western world as we know it had been shaped by knowledge and information discovered by the ancient Greeks. The renaissance scholars as well as revolutionaries alike have taken inspiration from the classic Greek academics. This however would not be possible without translators. In the 8th century, during the times when Europe had almost forgotten about philosophers like Aristotle, Plato or Socrates, Arabic translators were commissioned to interpret Greek intellectual works, which later consequently became an inspiration for some Western academics. During the cold war between East and West, U.S and Russia or capitalism and communism, the tension was extremely high. In fact, many historians agree that the world was at the brink of World War III. In order to avoid any unnecessary pressures, words spoken by the leaders and politicians involved were extremely calculated. Well, until November 18, 1956, that is. On that day, the Russian leader Nikita Khrushchev, who was known for his explosive character, speaking at the Polish embassy in Moscow said: “Мы вас похороним!”, which was translated literally by Khrushchev’s interpreter, Viktor Sukhodrev as: ‘’We will bury you!” As you can imagine, this wasn’t received lightly by the Western delegates, some of whom even left the room. Today, it is clear that the literal interpretation of Khrushchev’s remark was a mistake. An interpretation which would have been more suitable, given the context, would be “We shall be present at your funeral” or “We shall outlive you.” This comment, although not meant as a threat, was taken as such by the Western countries, and politically affected the already tense situation. Although Khrushchev’s misinterpretation was a serious mistake, it only led to political and economic consequences, rather than any physical damage. Unfortunately, this short answer was translated as ‘’Not worthy of a comment’’, and only 10 days later the U.S dropped atomic bombs on Hiroshima and Nagasaki. The U.S National Security Agency later said that: “Whoever it was who decided to translate ‘mokusatsu’ by the one meaning (even though that is the first definition in the dictionary) and didn’t add a note that the word might also mean nothing stronger than “to withhold comment” did a horrible disservice to the people who read his translation”. As you can see, words matter. An accurate translation which takes into account all factors which can directly or indirectly affect it, is nothing short of vital. Whether you intend to translate your company’s website, legal documents or speech for a world leader, we’re here to help.